Andrew Wheeler, the acting administrator of the Environmental Protection Agency, will be nominated for the top job on a permanent basis, President Trump announced on Friday. Wheeler has directed multiple efforts to roll back environmental regulations on the utility and transportation sectors, including rules on carbon emissions from coal plants and tailpipe pollution from automobiles. He will need to be confirmed by the Senate. Wheeler took over for embattled former administrator Scott Pruitt in July. He previously worked as a lobbyist for coal mining companies, including Murray Energy, pushing their deregulatory agenda with the Trump administration. Wheeler’s confirmation as permanent head of the EPA would likely mean the agency’s multiple deregulatory actions for industry will continue uninterrupted. While his predecessor was dogged by multiple ethics scandals, Wheeler has kept his name out of the headlines as he directs efforts to dismantle environmental regulations put in place by the Obama White House. Those include vehicle emissions standards that were set to accelerate under the previous administration. In August, Wheeler announced plans to freeze those standards and revoke California’s authority to set stronger rules for car engines and electric vehicles. Also in August, Wheeler announced plans to roll back the Clean Power Plan, a sweeping rule that would have required coal plant owners to shift to lower-emitting forms of power generation. EPA now plans to replace it with a less stringent rule that would only require modest efficiency upgrades at coal plants. Wheeler has also pushed other coal sector priorities, including rollbacks of mercury pollution regulations and the nation’s first federal rules for the disposal of coal ash, a hazardous byproduct of power generation. Wheeler’s first move as acting administrator was to announce a new, less stringent ash rule for plant owners. Environmentalists and public health groups say Wheeler’s recent work for industry represents a conflict of interest with the EPA’s regulatory mission. Until August 2017, Wheeler was registered as a lobbyist in Washington where he represented companies regulated by the EPA. One of those clients was Murray Energy, the largest privately owned coal mining company in the U.S. In March 2017, Wheeler was present at a meeting between CEO Bob Murray and Secretary of Energy Rick Perry during which Murray gave the secretary an “Action Plan” to save the domestic coal sector. The plan and others submitted to the White House included a number of actions EPA has since undertaken, including rollbacks of the Clean Power Plan and coal ash rule, as well as an ill-fated power plant bailout that the White House submitted to the Federal Energy Regulatory Commission last year. Wheeler defended his record as a lobbyist when he took the helm at EPA in July, touting his work on health benefits for miners, as well as his previous experience as a career staffer at EPA. Environmentalists, however, say his actions show a clear connection to the sector he used to represent. Hearings have not been set yet for Wheeler’s confirmation, but are likely early next year. Despite likely opposition from Whitehouse and other Democrats, Republican control of the U.S. Senate makes confirmation likely. The utilities announced the commission’s approval in a news release Monday. The merger remains contingent upon approval from the Public Service Commission of South Carolina. Previously, the merger had received approval from a number of agencies, including the U.S. Nuclear Regulatory Commission, which approved the indirect transfer of the operating license for the V.C. Summer Nuclear Station from SCANA subsidiary South Carolina Electric & Gas Co. to the Virginia-based company. SCANA needed a buyer after spending $5 billion on a pair of reactors abandoned a year ago at V.C. Summer, costing thousands of jobs. The move spawned more than a dozen lawsuits and followed the bankruptcy of lead contractor Westinghouse. You won’t have to look far to find a renewable energy market worth tracking next year. As more countries establish gigawatt-scale markets for renewables and storage, the global picture is getting much more diverse. Experts helped GTM identify at least 29 countries where wind, solar and energy storage prospects will be worth keeping an eye on in 2019. Despite recent currency problems, Wood Mackenzie Americas Power & Renewables Analyst Manan Parikh believes new national net metering policies could stimulate the growth of distributed solar systems of up to 300 kilowatts across Argentina. The country has also been identified by Dana Younger, chief renewable energy specialist at the International Finance Corporation, as a wind market to watch. Australia is hardly a new market for solar, but that won’t make it any less interesting in 2019, said Wood Mackenzie solar analyst Rishab Shrestha. “Australia’s utility-scale solar [market] is picking up pace rapidly from this year onward through 2020,” he said. Australia has a solar pipeline of more than 30 gigawatts, he said, as a result of the country’s Large-Scale Renewable Energy Target, corporate power-purchase agreements (PPAs), state auctions and merchant projects. Europe’s largest behind-the-meter storage system, with 4.3 megawatts of power, has been installed in Belgium, said Alex Eller, senior research analyst for energy at Navigant Research. Recently announced projects in the country include flow battery demonstration projects totaling roughly 5.5 megawatt-hours of capacity and an 18-megawatt Tesla system in Terhills, eastern Belgium, providing reserve and frequency control on electricity trading markets. China is top of the list for just about any renewables watcher. But it has historically lagged behind expectations on energy storage growth, said Eller of Navigant. This changed in 2018, with more than 2.2 gigawatts of new electrochemical storage projects either planned or under construction, according to the China Energy Storage Alliance. “I predict 2019 will be a huge year for the country’s industry,” Eller said. Wood Mackenzie’s Parikh said there is still a significant amount of enthusiasm for solar in Colombia despite auctions being pushed back from January to March next year. The announcement of utility-scale projects by Enel and Celsia shows there are ways that plants above 20 megawatts can skip an extensive approval process, although the commercial and industrial segment remains the main market opportunity in Colombia. The financial close of a 250-megawatt project from a consortium led by Engie in the Gulf of Suez has added to hopes for a growing wind industry in Egypt, with 1.2 gigawatts of capacity potentially being developed by companies such as ACWA Power and Marubeni. The country, home to the world’s biggest PV complex, is also highlighted as a solar market to watch by Josefin Berg, research and analysis manager for the solar and energy storage research group at IHS Markit. The small European Republic of Estonia is attracting wind industry interest over plans for offshore installations in the Baltic Sea, said Richard Heap, editor-in-chief at specialist analyst group A Word About Wind. Stephen Bull, senior vice president of the wind and carbon capture and storage business at Equinor, the oil, gas and floating wind foundation firm, has also cited the Baltic Sea as a potential hotspot for offshore installations. The International Finance Corporation is expecting to see an uptick in wind development in Ethiopia beginning next year, when the country will be the first in Africa to benefit from extension of the IFC’s Scaling Solar program. The program has traditionally helped African governments, apart from South Africa, to support privately funded solar projects. But in Ethiopia it will be extended to cover wind, too. The country is aiming to install 5.2 gigawatts of wind by 2020, from 324 megawatts today. Alex Eller at Navigant said demand for storage in Ireland is rising on the back of high electricity prices, increasing renewable generation and the island’s inherently restricted grid. A total of 373 megawatts of new energy storage capacity is being processed in the country. Regulators are planning to launch the first auction under the country’s Renewable Energy Support Scheme, which is expected to procure 140 megawatts of fast-responding capacity for grid stability services. Italy is one of a couple of southern European solar markets that once had strong growth. The country will be worth a second look next year. The Italian government is targeting 72 terawatt-hours of solar generation a year by 2030, up from around 25 terawatt-hours today, said Tom Heggarty, senior analyst for global solar PV at Wood Mackenzie. It is planning seven joint wind-and-solar auctions between 2019 and 2021. Companies such as Equinor are keeping an eye on Japan’s plans for offshore wind, which came a step closer to reality this year when Tokyo Electric Power Company, Japan’s largest utility, signaled major investments in the technology. Given Japan’s historic hesitancy to bet fully on offshore wind, adding it to the list of markets to watch in 2019 may turn out to be optimistic. But the potential size of the market means few will want to miss the business opportunity when it finally occurs. Along with Estonia, Lithuania is one of several Eastern European markets that experts are watching for action next year. The country got more than 33 percent of its electricity from wind in 2017, and in June this year approved a new national strategy to meet 80 percent of its total energy demand through renewables by 2050. Although hardly set to become a galloping energy storage market anytime soon, the landlocked Asian nation of Mongolia deserves a place on the 2019 watch list after signing a groundbreaking finance package for 41 megawatts of distributed energy with batteries. The $66.2 million package, from the Asian Development Bank, the Strategic Climate Fund, the Japan Fund for the Joint Crediting Mechanism and the Mongolian government, will be used to deliver clean energy to 260,000 people in the remote west of the country. The IFC is hoping 2019 will see a renewal of wind project activity in Morocco after four years of scant progress. Some of the projects on the drawing board are rather speculative, such as Soluna’s plan to build a 900-megawatt off-grid wind farm in the desert. But project developers are eager. Soluna’s CEO John Belizaire, for example, told GTM he is confident in getting a grid connection to the project within a year of commissioning, and the risks are low. “Morocco has established legal frameworks where the rule of law is sound,” he said. Dana Younger at the IFC has cited Pakistan as a promising upcoming market for wind. The country is looking to double the share of wind and solar in its energy mix by 2022. And in November it is set to host the seventh World Wind Energy Conference. The country is heavily dependent on imported oil and gas, so there is an incentive to invest in wind. However, wind projects may have to compete with extensive coal deposits uncovered in 1992 and now being exploited for power generation. “Poland is trying to rebuild investor confidence after the government that took power in 2015 did major damage to onshore wind support mechanisms,” said A Word About Wind’s Richard Heap. The nation also looks promising for offshore wind — as long as investors can be persuaded that the government’s new wind-friendly stance is for real. The Iberian Peninsula, where Spanish legislation hampered solar development for the best part of a decade, is now once more looking up for PV. Portugal, which has long had a more favorable stance toward renewables than Spain, looks set to benefit from its proximity to the once-more growing Spanish market. Fun fact: Portugal is also looking to get into the battery game, with lithium exploration licenses up for grabs this year. Russia appeared to signal growing support for wind power last year when it unveiled a $1.7 billion development fund targeting the sector. The market hasn’t exactly raced ahead since then, but increasing levels of development earned it a spot in A Word About Wind’s latest Emerging Markets Attractiveness Index, ahead of other potential wind hotspots such as Argentina and Pakistan. After a few years of high uncertainty, the South African solar market is ready to re-emerge with the signing of PPAs from round 4.5 of the Renewable Energy Independent Power Producer Procurement Programme, plus a fifth bid window set for November, Attia said. Navigant’s Alex Eller also identified South Africa as a market to watch for energy storage. The national utility Eskom has announced a two-phase plan for 1.4 gigawatt-hours of energy storage at its sites throughout the country, he said. Tom Heggarty of Wood Mackenzie said upward of 20 gigawatts of solar projects are currently looking for grid connection permits across the Iberian Peninsula. Around 4 gigawatts of capacity got awarded through Spanish government auctions in 2017, but some developers see more potential in signing utility or corporate PPAs. With prices as low as €40 ($46) per megawatt-hour, Spain is “all about unsubsidized solar,” Heggarty said. Although still a small market, Thailand’s energy storage sector is “gaining momentum quickly,” said Eller at Navigant. Regulators are looking to use energy storage to help increase the level of renewables on and off the grid, with one 3-megawatt system already in operation and more planned. The IFC sees potential growth in Turkey’s wind market despite President Tayyip Erdogan’s ultranationalist and protectionist leadership representing a relatively high-risk bet for developers. Turkey is looking to add 16 gigawatts of wind capacity by 2030 and is planning 1.2 gigawatts offshore. “There is plenty for investors to get stuck into,” according to A Word About Wind’s Emerging Markets Attractiveness Index. The U.S. leads the world in energy storage, and its 2019 market won’t disappoint. Behind the meter, watch out for Massachusetts, New England and New York, as well as California and Hawaii, said Wood Mackenzie Senior Energy Storage Analyst Brett Simon. For front-of-meter action, “keep a close eye on the Carolinas,” said Daniel Finn-Foley, another senior energy storage analyst at Wood Mackenzie. “Duke’s heavy investment in storage there could spark interest across the Southeast,” he said. Nuclear-and-fossil-fuel-heavy Ukraine is quietly emerging as an interesting market for wind developers. Ukraine commissioned 50.35 megawatts in the first half of 2018, bringing cumulative capacity to 515.5 megawatts, said the Ukrainian Wind Energy Association. In August, Turkish construction and engineering firm Guris Insaat ve Muhendislik started building a 32.4-megawatt wind farm. And in September, the Norwegian wind developer NTB announced a 250-megawatt project in the south of the country. 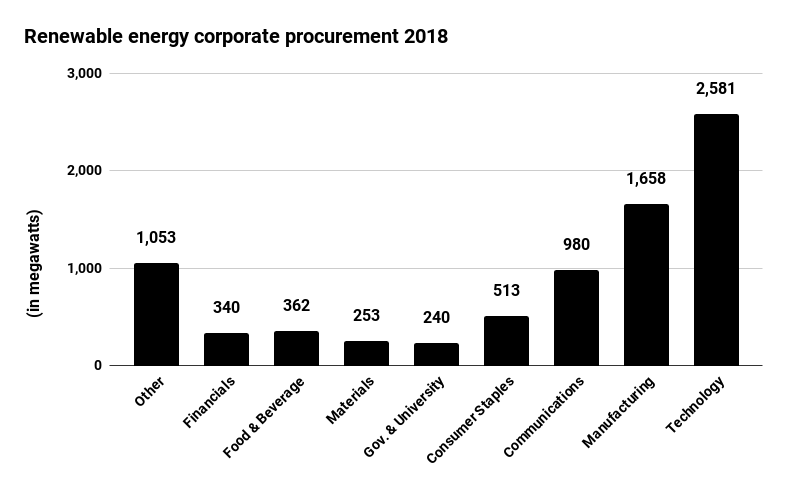 Bloomberg New Energy Finance (BNEF) data shows the tech industry has signed deals for 10.4 GW of renewables and tech-related corporate purchasing has already set records this year. As more devices are connected to the internet, data flows are expected to grow rapidly. Cisco expects a 75% increase in global data as the internet of things (IoT) expands. Google has become the largest corporate buyer of renewable energy in the world, as it tries to eliminate all emissions from its footprint, but other big names like Facebook, Apple and Microsoft, are also investing heavily. As more tech companies commit to renewable energy, they are increasingly driving green power adoption. Google, in particular, is leading through its efforts to run all of its data centers with renewable energy, according to BNEF. Google has now purchased over 3 GW of renewable energy, followed by Facebook (2 GW), and Microsoft, Amazon and Apple (1 GW each), BNEF told Bloomberg. The firm’s data showed the tech sector leading the year with renewable energy corporate procurements. Companies were already on pace to lead clean energy development: an earlier BNEF report found corporate purchases by August had already topped the 2017 amount by almost 2 GW, with 7.2 GW of clean energy. There are 25 billion devices connected now, “and the numbers are expanding exponentially,” Richard Mroz, senior advisor of state and government relations for Protect Our Power, said. And IHS Markit expects estimates data centers account for between 2% and 3% of electricity demand in developed nations, primarily for cooling. While Google hit a milestone last year, purchasing sufficient renewable energy to power its global operations, the search engine giant is now trying to attune the timing and location — a much tougher task. Last month, the company published an analysis that showed none of its data centers in 2017 were matched 24-hours-a-day, every day with 100% carbon-free energy. The answer may be batteries, which tech companies have been purchasing. Amazon has recently been purchasing batteries from Tesla, to help power its U.K. distribution centers. In July of 2017, NREL, CGC, and the Nevada Governor’s Office of Energy co-hosted a one-day workshop with a number of Nevada stakeholders that was a key first step in implementing the Nevada Clean Energy Fund. The discussions centered around the Clean Energy Fund’s organization structure, governance, board members and the desired knowledge base, long term funding options, and consideration of the different potential products to be offered. The workshop materials can be found herePDF. Kenyan McDuffie Chair, Committee on Business and Economic Development October 29, 2018 Oversight Hearing on the Bill 22-904, the Clean Energy DC Omnibus Act of 2018. BILL SUMMARY – As introduced, this bill increases the Renewable Portfolio Standard to 100% by 2032, establishes a solar energy standard post 2032, and establishes standards electricity suppliers must meet regarding purchasing a percentage of their energy from long-term purchase agreements with renewable generators. It removes restrictions on energy efficiency measures. It expands the uses of the Sustainable Energy Trust Fund and also establishes an energy performance standard program for buildings at the Department of Energy and Environment. Among other things, it authorizes the Mayor to commit the District to participation in regional programs with the purpose of limiting greenhouse gas emissions and requires the Department of Motor Vehicles to issue regulations tying the vehicle excise tax to fuel efficiency. You can now Watch both videos on the D.C. Council held the two public hearings on a historic bill to power the District with 100% renewable energy sources by 2032, including 5% from local solar. Our first annual report is ready! Want to know what we’ve been up to in the last fiscal year? All the details are in our newly-released report. We’ve created a short video to help everyone understand how we work to accelerate clean energy and energy efficiency in the County. See the link below! We are hiring! We’re looking for a Product Marketing Representative to support our marketing and outreach activities for our financial products. More information is below. Calling all energy contractors serving Montgomery County! Are you helping your business customers plan their capital projects for next year? Are they considering energy improvements? Attend our webinar on November 15th and learn your options to make these projects more affordable! Check out our Commercial Loan for Energy Efficiency and Renewables (CLEER). It makes clean energy projects more affordable. Offers no money out and no cash flow impact. Want to learn more about our Authorized Contractors? Take a closer look. A Regular Board Meeting will be held in November. Details are below! Our Annual Report is Ready! 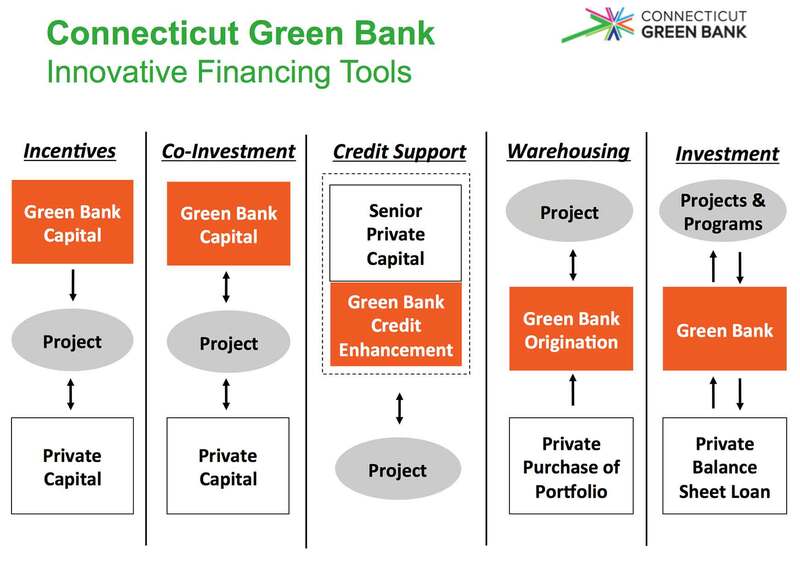 In 2018, we did so many exciting things with our partners to help expand financing options for energy improvement projects in Montgomery County.We launched our first loan product, met with many stakeholders across the region, attended conferences and festivals and held a workshop to spread the word on the green bank model. Follow Sally, a local commercial property owner, and Derrick, her employee, as they explore options for clean energy and energy efficiency. Click on the image above or visit our homepage! 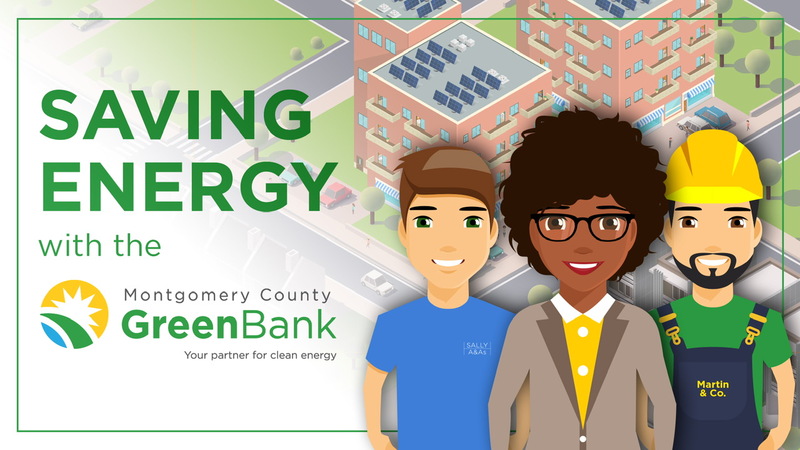 This video is meant to help everyone understand our role in driving the adoption of clean energy and energy efficiency in Montgomery County. If you’d like to let us know what you think, feel free to send us an email at info@mcgreenbank.org. Interested in helping the Montgomery County Green Bank? We’re looking for a full-time Product Marketing Representative to work in our Rockville office! 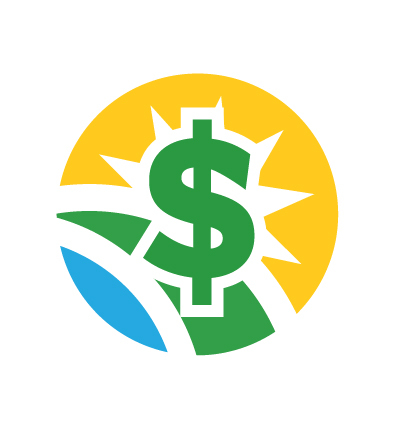 This person will be knowledgeable about energy efficiency and renewable energy contracting work and will support outreach and education activities for commercial and residential contractors, businesses and property owners in the County. If you know a savvy marketing communications person who would be great for this role, please share our job description and send him/her our way. Calling All Energy Contractors Serving Montgomery County!It’s Budget Season! Thinking of Financing Options for Your Customers? Learn more about what’s locally available! We’re holding a webinar to help you understand all the options out there for your commercial and industrial customers as they go through capital improvement budgeting and decision-making for next year.Our panel will include Tom Deyo from the Montgomery County Green Bank and Lindsey Shaw from Montgomery County. They will walk through current financing options regarding the Commercial Loan for Energy Efficiency and Renewables (CLEER) and the Commercial PACE program available to your commercial and industrial customers. Bring your questions and offer your thoughts. These options can help your customers move forward if they were not able to get budget funding to cover their projects, or help them finance larger projects than they could afford on their own. If you’re interested but can’t attend the live event, please register and we will make sure you receive a recording. and Renewables (CLEER) may be for you! Ability to align payments with energy savings over time. Loan proceeds can be used for a variety of energy efficiency measures – including all Pepco Energy Savings for Business Eligible Measures PLUS solar PV, energy storage, gas furnaces and combined heat and power. If you are a contractor who would like to work with us, click here. We’re proud to be working with some of the best energy contractors in the County to bring you affordable and accessible financing that will save your business cash. Our contractors are well-versed in the benefits of CLEER, our financing product for commercial and industrial property owners. Wondering who is on our list? Take a closer look! The agenda is available here.Location: Montgomery County Green Bank, 155 Gibbs Street, 4th Floor Conference Room, Rockville, MD 20850The public may attend these meetings. If you wish to attend, please RSVP in advance to info@mcgreenbank.org. The Maryland-DC-Delaware-Virginia Solar Energy Industries Association says: “Our Government Champion is the public official who best recognizes the economic and social value of solar power, but seeks to guide the industry’s growth through innovation and equity. The DC Office of the People’s Counsel has been a leading voice among consumer advocates for solar consumer education, expanded solar access and the benefits of distributed energy resources for the larger grid. “This is unquestionably due to the leadership of Ms. Sandra Mattavous-Frye; she and her staff have coordinated countless consumer education workshops, in all eight wards of the city, to equip DC residents with the information they need to go solar. While FERC expressed concern about the impact of clean energy policies among different states in the region, it did not ask for a plan that would prop up generators at the expense of customers. In the absence of federal climate leadership, state and local governments have shown up with strong commitments to decarbonize the energy sector. PJM’s proposed redesign of its regional electricity “capacity” market would hamstring state clean energy initiatives throughout the largest electricity market in the United States, cumulatively about one-fifth of the U.S. power supply. Of the 13 Mid-Atlantic states, plus the District of Columbia, in the PJM electricity market, 12 have a renewable portfolio standard or serious renewable energy goal. In the wake of increasingly alarming concerns about the pace of climate change, states throughout PJM are developing more aggressive clean energy goals. There’s a lot at stake. The Federal Energy Regulatory Commission (FERC) recognizes the importance of allowing states to meet these goals without overburdening customers. When FERC ordered PJM to reshape its capacity market (in which electricity is contracted for three years into the future to secure long-term grid reliability), FERC also ordered PJM to explore ways to accommodate state clean energy programs and protect customers from unnecessary costs. Unfortunately, PJM’s proposal released this month goes in the opposite direction: punishing clean energy and charging customers. We have until November 6 to raise concerns to FERC and prevent PJM’s proposal from becoming a market rule. PJM’s plan is akin to a billion-dollar giveaway at consumers’ expense to a few lucky fossil fuel generators. While we previously raised alarms about PJM’s plans, this proposal is worse than expected. It may be better for many future clean energy resources to exit the PJM capacity market than take the extended resource carveout option, in which they must literally make payouts to dirtier plants. The proposal targets low-carbon energy sources because PJM views financial support in the form of state renewable energy or zero-emissions credits as “distorting” the market. Opt out of the capacity market through the “resource carveout option,” or potentially the even more punishing “extended” carveout. PJM’s proposed options for clean energy resources represent body blows to state climate policy and customer wallets in the following ways. 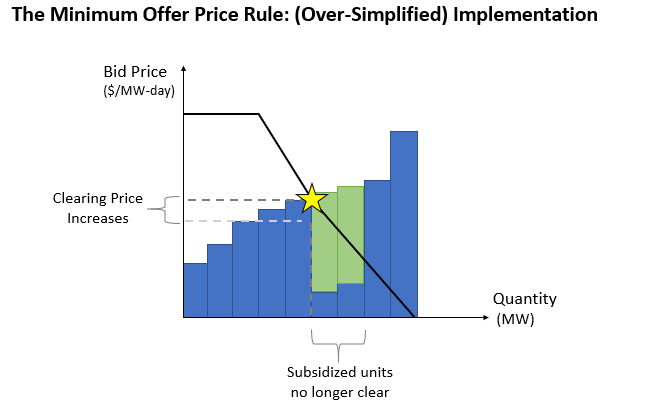 Under PJM’s plan, generators receiving a state subsidy of more than 1 percent of their expected revenue would automatically have their bid prices increased through the MOPR, which is essentially a resource-specific price floor for bids in the capacity auction. The way the MOPR works is complicated, but the effect is that it sets a higher minimum price in an attempt to estimate what the price might have been without any state support — in other words, canceling out state clean energy policy. PJM and other MOPR proponents argue that state clean energy support allows generators to bid at a lower-than-actual cost, distorting the market. This view ignores the fact that state policies like renewable energy credits (RECs) compensate resources for their environmental attributes. The chart below depicts PJM’s rationale. 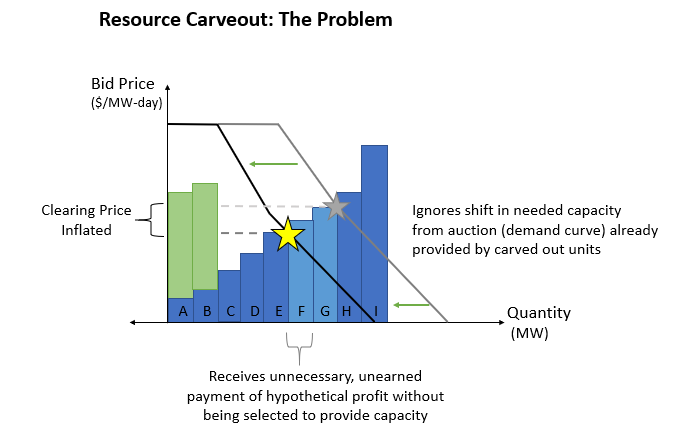 Each blue bar represents a supplier bidding in the capacity auction (forming a supply curve), and the downward-sloping line represents capacity demand. Generators submitting prices lower than the “clearing price,” marked by the star where supply meets demand, are selected to sell capacity. The green bars represent revenue a low-carbon resource might receive from a state program. The MOPR forces resources to include this revenue in their bid price. As demonstrated in the next chart, the consequence of the MOPR is that the subsidized units often no longer clear in the auction. As a result, capacity prices increase and excess capacity is procured because the subsidized resources still provide electricity according to state mandates. The FERC order explains why this option is bad for customers: state policy mandates clean energy as part of the electricity mix, so the plants already exist and are able to provide capacity. But if the MOPR prevents this clean energy from clearing in the capacity market, customers must then pay for more — and unnecessary — capacity to meet PJM’s capacity requirement. PJM suggests that if state-supported energy sources want to avoid the MOPR, they can commit to not taking any subsidy revenue. Telling generators to forego state clean energy programs isn’t exactly “accommodating” such policies. Instead of facing the MOPR, subsidized resources could opt out of the capacity market competition and instead select PJM’s resource carveout option. Again, the resource carveout is supposed to be PJM’s answer to the excess-capacity problem FERC recognized with an extended MOPR. Unfortunately, the conditions of the carveout are so unfavorable to clean energy options, it is unclear why a supplier would choose it over not participating altogether. Even if renewable generators do choose this course, it will be at a high cost to customers. PJM’s Independent Market Monitor found that capacity costs would nearly double in a single year, from $9.3 billion to $17.7 billion, under PJM’s carveout plan. This near-doubling of costs would occur in a potentially realistic scenario assuming just under 15 percent of the total market resources would be affected by PJM’s plan. An irony can be found in the distribution of costs. PJM claims that state clean energy policies are unfair because policies in one state can affect customers in another PJM state without such policies, yet PJM’s proposal would result in wide-ranging impacts by geography, with some zones seeing price increases as high as 214 percent while others experience only a 20 percent change. Under the proposal, when a resource chooses the carveout, the capacity it will provide according to state mandates (and likely bilateral purchase agreements) is counted toward PJM’s overall capacity goal. In other words, the renewable energy is credited to the system so that less capacity must be bought from other sources. However, the carved-out resources aren’t compensated by PJM, per the first step of PJM’s two-stage proposal shown in the graph below. 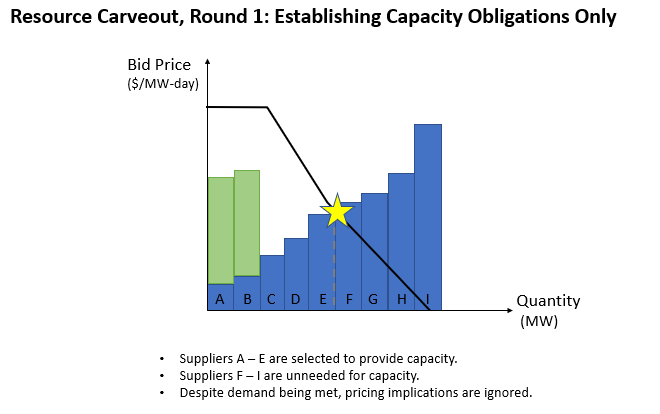 In the first round of the capacity auction, the carved-out resources are still considered when capacity obligations are selected. In this case, the carved-out resources are from Suppliers A and B. Note that Suppliers F and G are not assigned any capacity obligations. The second stage of the auction is what PJM calls an extended resource carveout. 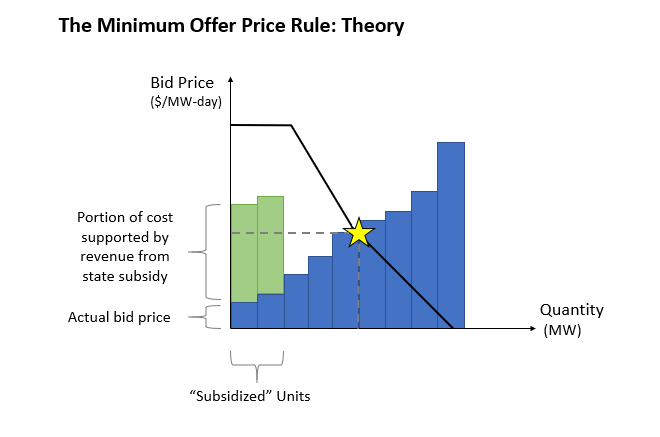 While typical market designs would determine capacity obligations and clearing price (in broader economic terms, equilibrium supply and demand) together, PJM determines the capacity obligations in the first stage of the auction, and then runs a second stage without the carved-out resources to determine price (ignoring already-built renewable energy). The most outrageous part of PJM’s proposal is that the carved-out low-carbon energy resources are required to pay a consolation prize of sorts to the dirtier fossil plants that cleared in the second auction but aren’t actually necessary for system reliability because of the presence of the subsidized units in the first auction. PJM says these payments represent the “deadweight loss cost” to the power plants whose capacity is not necessary for the system, called inframarginal units. These units don’t have to provide capacity services, but the subsidized resources would be forced to pay them their hypothetical profits from the capacity market anyway. PJM justifies this unwarranted cash giveaway as necessary to preserve the competitiveness of the market. All of this is demonstrated in the graph below, where the subsidized generators A and B are carved out of the market, and price is set in an imaginary scenario where existing low-carbon generation is ignored. Generators F and G appear to clear, but aren’t actually assigned capacity — just payments from A and B. To emphasize: carved-out clean energy sources that provide capacity unpaid by the market will have to pay made-up profit margins to dirtier energy sources that do not provide capacity services. A supplier could submit a bid for capacity from a power plant to be built three years in advance, be categorized as an inframarginal unit, choose to never even build the plant and still receive the payment three years into the future. 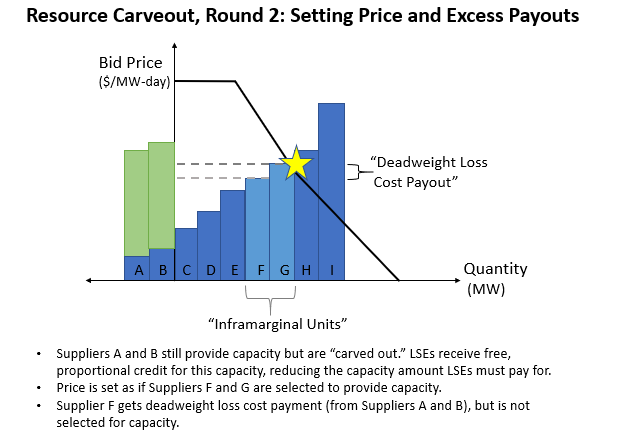 The final graph illustrates that in addition to the arbitrary payments, carved-out resources must pay inframarginal units, the resource carveout design has market-wide impacts of higher costs. PJM seems to assume that all subsidized resources will pick one of the three options. But what if the resource opts out of PJM’s capacity market altogether, an option that could likely be in a renewable generator’s best financial interest? This possibility is significant because low-carbon energy can also face penalties for not performing when needed under existing rules for capacity performance — meaning that renewable energy would need to be paid enough other revenue for its capacity to make the risk of incurring these market penalties worthwhile. This opt out scenario would also take the market back to the same unacceptable situation as having an expanded MOPR with no “options” at all: more capacity being purchased than customers need, resulting in higher costs and more high-polluting power plants. While FERC expressed concern about the impact of patchwork clean energy policies among different states in the region, it did not ask for a plan that would prop up generators at the expense of customers. PJM’s proposal would penalize clean generation owners, the majority of states in the region with clean energy policies, and anyone with an energy bill in these areas. Luckily, FERC has other options, including a proposal from clean energy and consumer advocates that designs a mechanism for accommodating an opt-out of the capacity auction that doesn’t result in unnecessary handouts to uncompetitive generators or in excess capacity procurement. A set of shared principles from an even broader group of stakeholders gives FERC another way of looking at these issues. Reply comments, where stakeholders can respond to the PJM plan, other comments and proposals submitted to FERC in early October, are due to FERC on November 6. Until then — and until FERC makes its decision, let’s increase awareness about what PJM’s resource carveout option would mean for America’s biggest energy market. State governments should submit comments in strong support of their right to clean energy and climate policy, and anyone paying bills in PJM or with concern about climate change should urge them to do so, too. Papi Kymone Freeman (guerrilla artist) is one of the leaders of #DC Ferguson, an organization devoted to exposing police terror in the Washington, DC area. Kymone, alone with Eugene Puryear, Salim Adafo and Kenny Nero have led non-violent demonstrations that have shut down major economic arteries in the nation’s capitol. Kymone is the director of the National Black LUV Festival that has since become the largest annual AIDS mobilization in Washington, DC. He has authored a collection of poetry entitled Blood.Sweat.Tears.